Year long participation in Community Events like First Friday. The History Challenge was composed several parts. Each part of the challenge had a corresponding “secret” code. 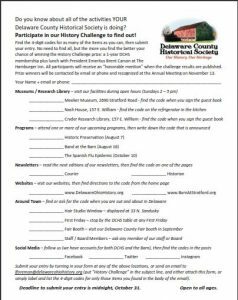 The codes were collected by attending Delaware County Historical Society programs, visiting our historic buildings, going on-line to our websites or social media pages, etc. The winning entry was submitted by Diana Toth. She received a free 1-year extension to her DCHS Membership, plus lunch with President Emeritus Brent Carson (“Mr. 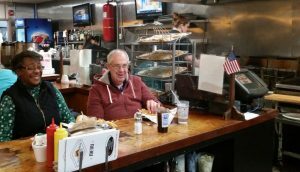 Delaware”) at the Hamburger Inn (one of Delaware’s historic restaurants, in business since 1932). Diana was also recognized at the DCHS 2018 Annual Meeting .